With all the action of a water slide and the extra activities of an obstacle course with more fun and more hydration. This unit starts with many obstacles, a climbing wall, then you get to the water fall and finally the splash pool. This smaller version Ultimate Water Challenge is great for all ages. Reserve and let us bring it out to your next Davenport, Bettendorf, Rock Island, Moline, Iowa City, Clinton or Quad Cities event. 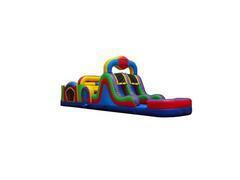 We are Iowa's #1 source for Waterslides and Water Inflatables.